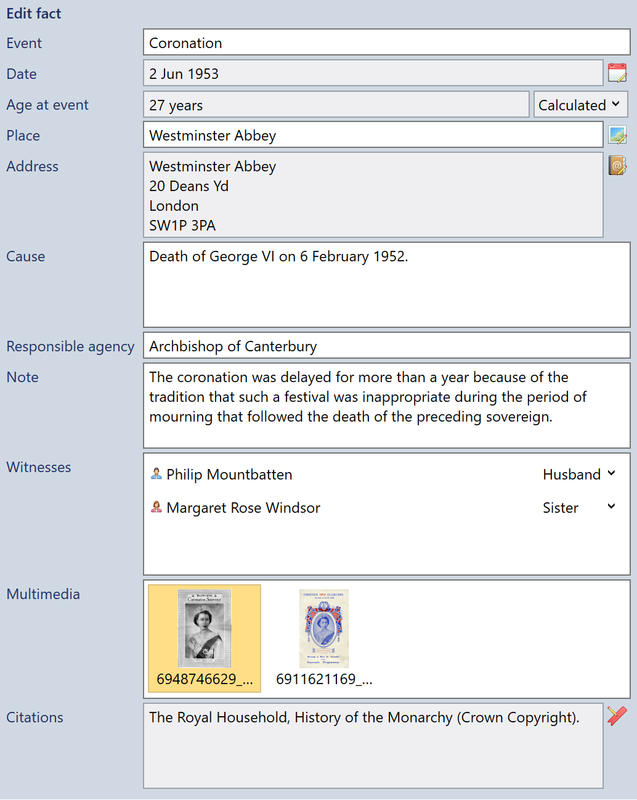 The Facts view is the place to record all the important details about the lives of family members. All facts can store details about the date and place of the fact, how old the person was at the time, notes about it and citations which reference the sources of the information. Fig 1. The Facts view. A full list of facts for the selected person is displayed in the facts list. The type of fact, the location and date are shown for individual facts. Shared facts display the name of the other person associated with the fact. You can filter the list and collapse sections containing each type of fact. Select a fact to edit it. Fig 2. The facts list. To add, remove or set a fact as the primary fact, right click the facts list. Fig 3. Adding a fact. Details about the fact can be edited in the left hand panel. There are lots of predefined types of facts which can be added to individual people. Shared facts can also be added if the current person has one or more spouses or partners. Attributes are general pieces of information about an individual person such as their title and nationality. Attributes have 'details' which summarise the textual representation of information. Events store details of significant happenings in an individual person's life such as their birth and death. Every person must have a birth event and if they are deceased, they must have a death event. Family events are similar to individual events except the event involves two people for example a marriage. If you want to add an attribute or event which is not already in the list of possible attributes and events, you can add a generic "fact" or "event". These generic types are fully customisable and you can specify extra information about the type of information being stored. On some occasions, you may want to store multiple facts for example when different source documents specify conflicting birth date information. In these case, you can add multiple birth events to store the information and then select the preferred birth as the primary event. Information from the primary fact is displayed throughout the application to represent that person.